Domain Architecture: How many pages does a roofing contractor really need? Often we see web design agencies charging clients by the page, or limiting the amount of pages the agency is willing to build. Well, when I’m asked how many pages I’ll build for a client, I typically respond with “What’s it going to take to get the job done?”. I designed the ultimate roofing domain layout and architecture below as just the BASIC layout for a roofing company that intends to grow. BayCountyRoof.com has over 25 pages on it’s domain. Each page properly linked to supporting pages. Each page serves a specific purpose supporting the user experience for anyone looking to install a new roof or hire for roof repairs. In the wake devastation from Hurricane Michael in Panama City, FL, thousands of homes needed repairs and each job proved to be unique. The purpose of this project was to build a website that looked great to viewers but worked as a BEAST when it came to inbound information and data. This website streamlined mass hiring to pull a dozen salesmen together, 6 office admin assistants, and hundreds of roofing installers from the surrounding areas. This set Bay County Roof apart from the pop-up “roofing contractors” who were in town to make a quick buck and then leave. Scroll down to read our in-depth strategy and how we dominated the area setting Bay County Roof as the industry authority. Create an online presence that establishes trust and efficiency within Bay County community. 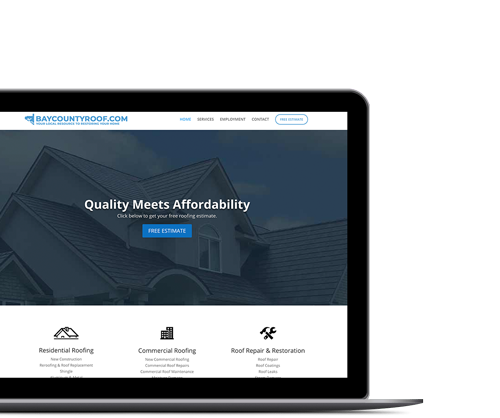 Develop a site that serves as an SEO friendly landing and conversion page for Bay County Roof. Ensure the business was properly submitted to search engines, listings, and maps. Competitor research to see what local contractors are doing and what keywords and keyterms should be targeted. Creating inbound and outbound forms to allow for mass estimates and quotes to be returned to homeowners in a timely manner. Create a system that generates material orders based on estimate variables to save time for office staff allowing for a larger load of clients and less room for error. Build a pre-application hiring process that allows for mass hiring and effective screening with the push of a button. The strategy for Bay County Roof was centered around being the best roofing contractor providing the most services at competitive pricing. My job was to capture this mission and have it displayed on our website. The damage to the area was substantial that getting the contracts was fairly easy. The most important detail that I had to implement flawlessly was maintaining lines of communication. How do we know a certain address has already requested an estimate or not? Which salesmen should this address be awarded? The Bay County Roof team was an invaluable resource as I was allowed to get my feet on the ground and see the sales pipeline face to face. The dev/design job was simple to grasp, but took time to integrate. Based on the inbound estimate request, a material ordered could be pre-made for when the estimate becomes approved. Build a pleasant viewer experience, relaxing to the eyes – The community has gone through a major storm, we wanted to be a symbol of peace and hope. We kept colors simple and peaceful. Bay County Roof is operating in a local area that has pop-up roofing contractors everywhere after the storm. However, Bay County Roof’s quick action allowed us to penetrate the market to become the authority in the area for storm recovery and repair. 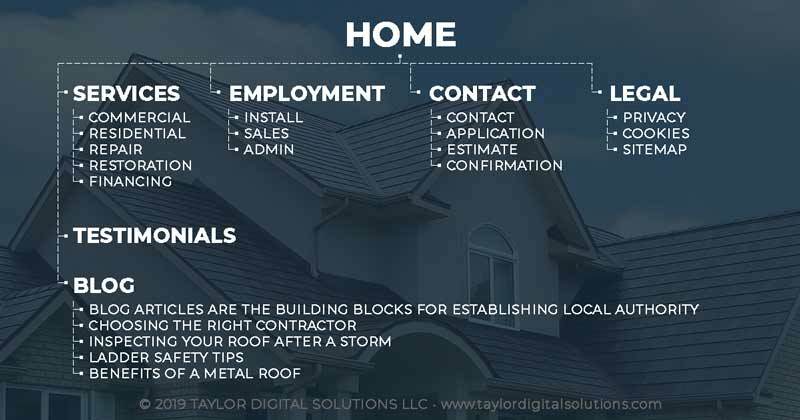 Taylor Digital Solutions simply captured the dedication and loyalty that Bay County Roof continuously provides to the community. We submitted the pages and services to the right search engines. We are extremely honored and proud to be part of the Bay County Roof team!